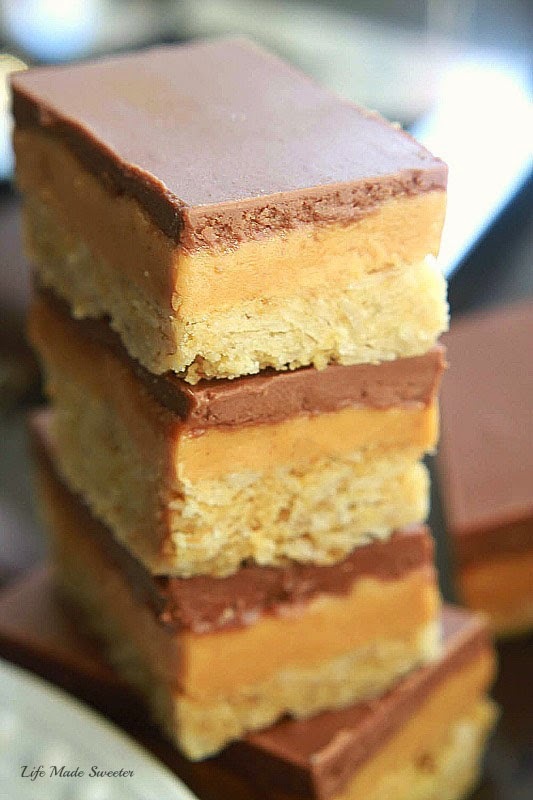 Layers of rich chocolate and creamy peanut butter over a soft and chewy oatmeal cookie base. Makes an easy and delicious sweet and salty treat! With all the excitement of spring and Cinco de Mayo, I totally forgot to share these oatmeal cookie bars with you guys back in February. 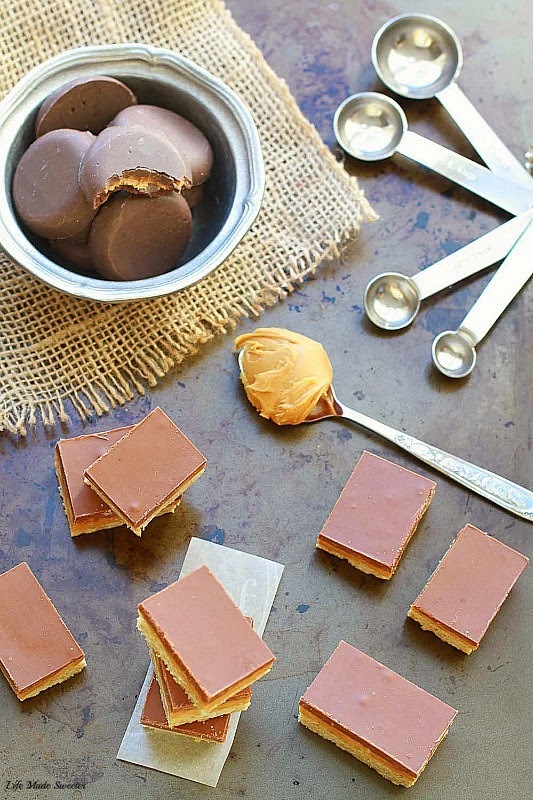 They were inspired by Reese’s peanut butter cups and the Girl Scout Tagalong cookies. 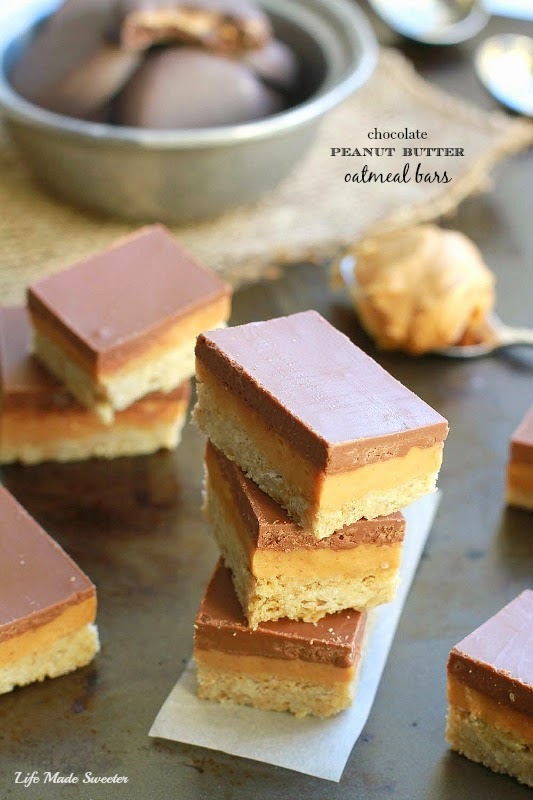 If you are a fan of chocolate and peanut butter, you totally need these in your life! They combine the two favorites over a soft and chewy oatmeal cookie dough making them the ultimate sweet and salty treat. The base comes together pretty easily in one bowl especially since there is no mixer involved. 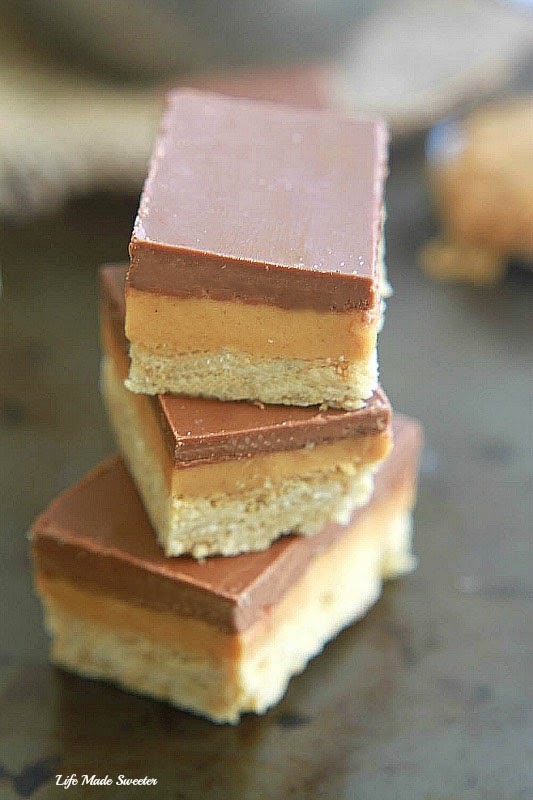 Once they are baked up, you spread a layer of creamy peanut butter followed by pouring another layer of rich melty chocolate on top. Be sure to set them aside to chill and set before cutting them into bars. They are the perfect treat to share with lots of people and since they’re so easy to make, you’ll want to make them over and over again for all those summer potlucks, barbecues and even a Mother’s Day brunch. Preheat oven to 350 degrees. Line an 8x8 square pan with parchment paper or foil sprayed lightly with cooking spray; set aside. In a large microwave-safe mixing bowl, add the butter and heat on high power to melt for about 90 seconds. Whisk in the brown sugar and vanilla until smooth. Add the flour, oats, baking soda, salt, and stir with wooden spoon or spatula until just combined. Do not over-mix. Add mixture to the prepared pan and smooth it with spatula or the back of a spoon, to create an even, smooth, flat layer. Bake for 21 to 24 minutes, or until edges are golden. Set aside to cool. Meanwhile make the filling by beating peanut butter, powdered sugar and vanilla together until smooth. Spread filling evenly over cooled crust. Smooth the top with offset spatula. Chill for about 30 minutes. In a medium microwave bowl, microwave chocolate chips and cream or shortening on high power in 15 second increments, stopping and stirring frequently until smooth. Do not overheat. Pour chocolate layer over peanut butter and shake the pan a bit to help chocolate slide and disperse. Then smooth it very lightly with an offset spatula, knife, or offset knife. Chill until chocolate is set before cutting and serving.